When I was asking my oldest what she wanted to be for Halloween this year, she replied with the answer that I am sure every other 5 year old girl replied when asked the same question: "Elsa". In the event that my youngest would have said she wanted to be Anna, we would have totally gone with the Frozen theme this year... especially since we already had the dress ups in our closet. (I honestly don't care what they choose to be for Halloween. I leave it totally up to them.) But, it wasn't meant to be... The youngest was set on Sheriff Callie. 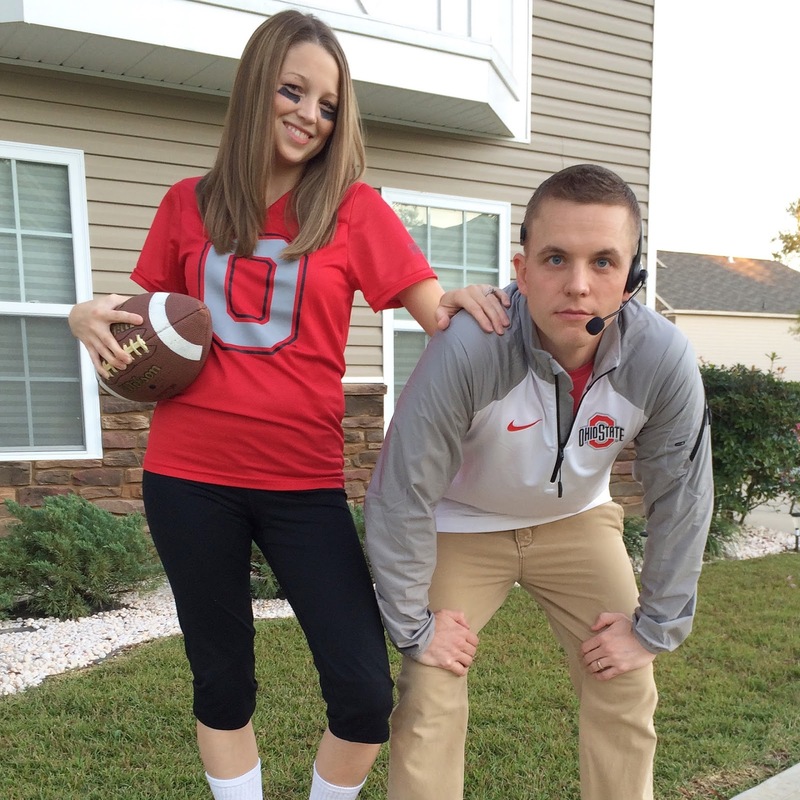 So if you read my last couple posts, you saw that I was forced into handmade Halloween costumes this Halloween. It really isn't a big deal. I know so many awesome moms make Halloween costumes every year... and who knows, maybe this was a first of many years of handmade Halloween costumes in our house. (never say never right?) 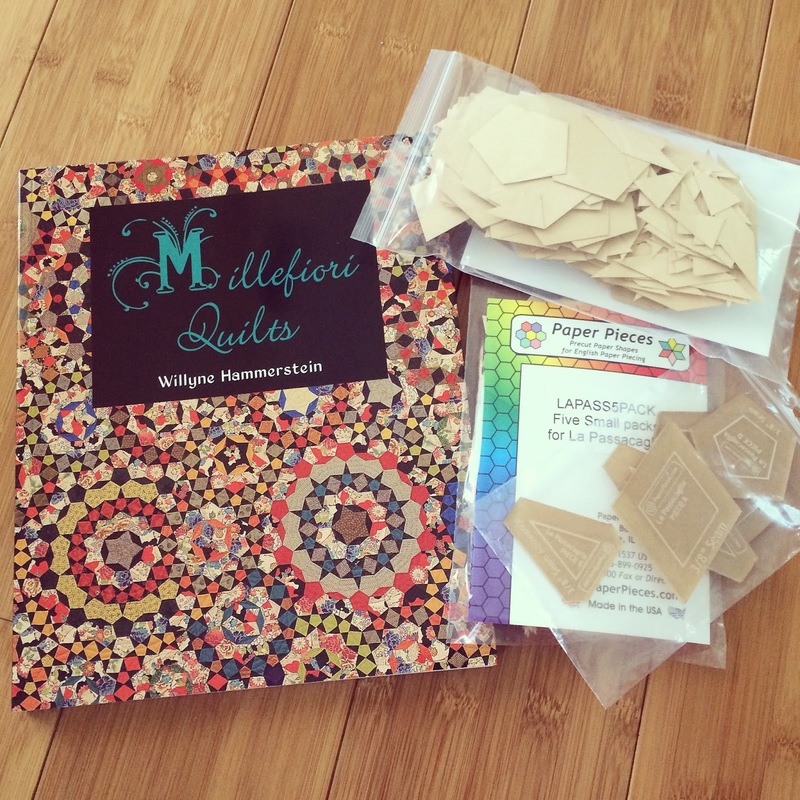 But I was not super excited to do handmade in the beginning... just because it ends up being more expensive to buy the supplies and it takes way more time obviously. After I got over the initial feelings of not wanting to be making costumes, I started to enjoy it. My girls were so excited to take part in putting the costumes together. Since our playroom and my studio are in the very same room, they played and would come check on the progress and try on their costumes along the way. It was a lot of fun. 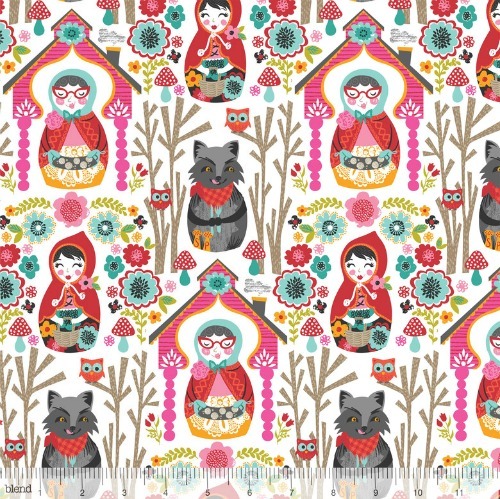 Once she saw the Little Red Riding Hood pattern, she was sold. Little Red is a favorite story in our home. 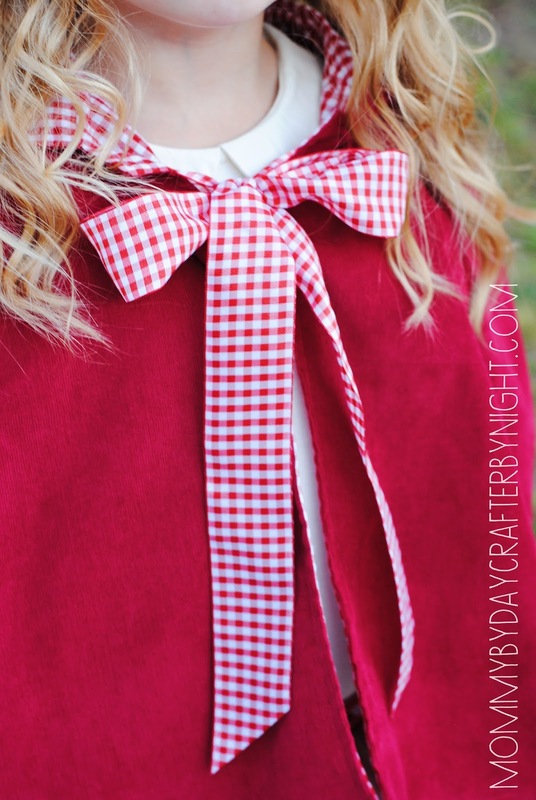 I made the hood with red micro corduroy (picked up at hobby lobby) for the outside and a red and white gingham fabric for the inside, which was a poly-blend so it was super lightweight (also hobby lobby). This combo was a dream. I loved that the cord was slightly heavier than reg. 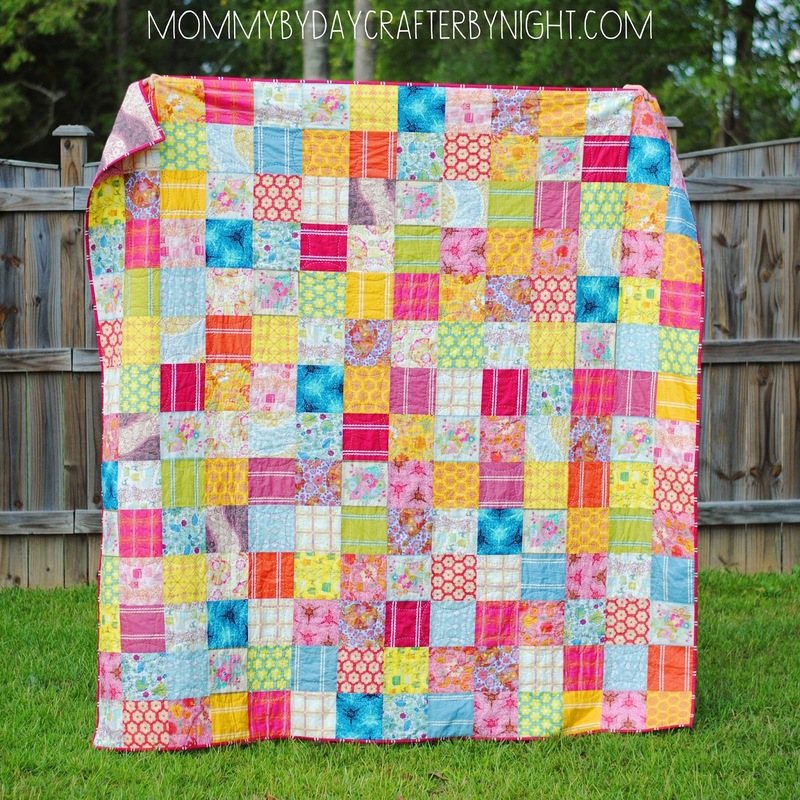 quilting cotton and the gingham was so lightweight which made the drape of the cape perfect. 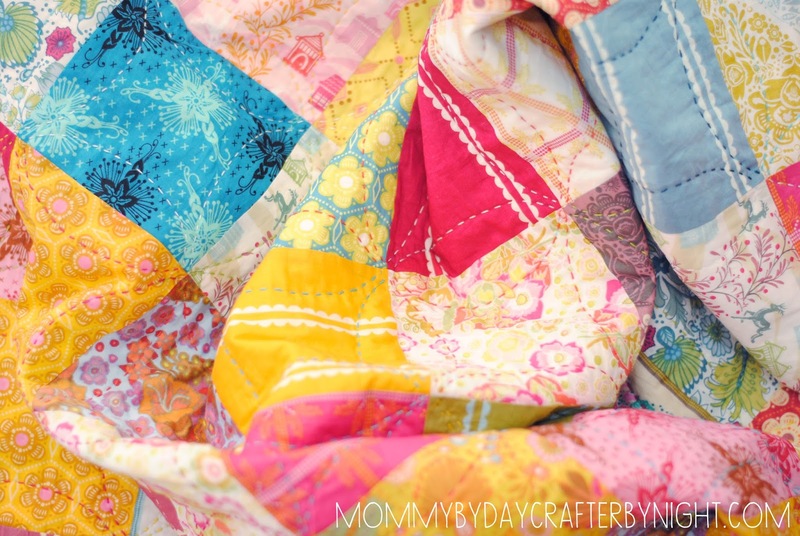 Also- since I didn't use quilting cotton, it isn't as prone to wrinkles. 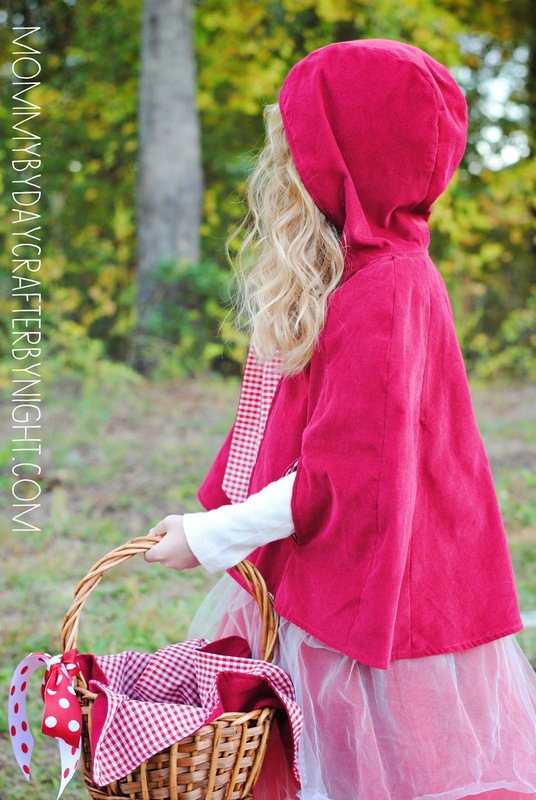 I made the smaller version of the two cape patterns for my 5 year old and it works great, especially since she is pretty tiny and my 4 year old also likes to play with it, but I would opt for the large size for 5 years and older definitely. The only modification that I made to the hood was that I left off the button closure and used gingham ribbon (hobby lobby) to make ties. 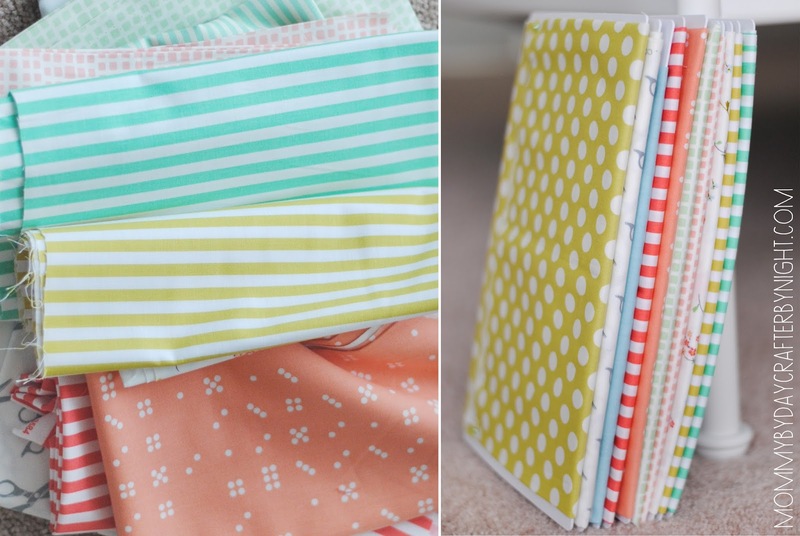 I decided to pair it with the tutu pattern in the book to make it a bit more frilly. I got all of my tulle at Hobby Lobby. 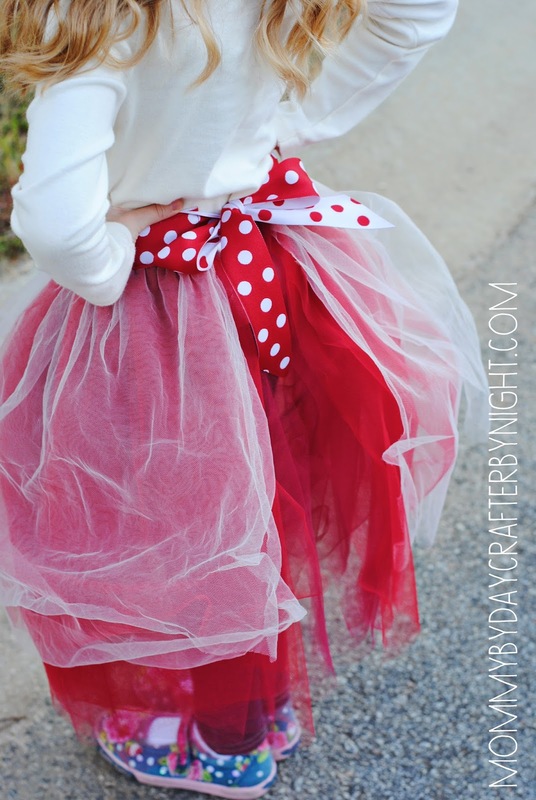 I used a combo of 2 layers dark cranberry red tulle on the bottom of the skirt, then 4 layers of cherry red tulle, and 1 layer of cream tulle. I also picked up my ribbon for the waistband at hobby lobby too. 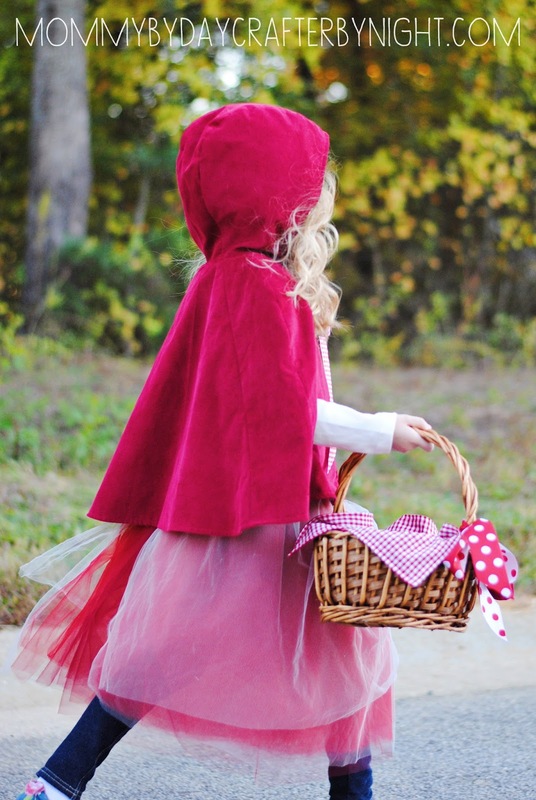 The last element for the costume was Little Red's basket. I found the perfect basket at Hobby Lobby and used leftovers of the fabrics and ribbon to make a quick liner and bow to dress things up a bit. 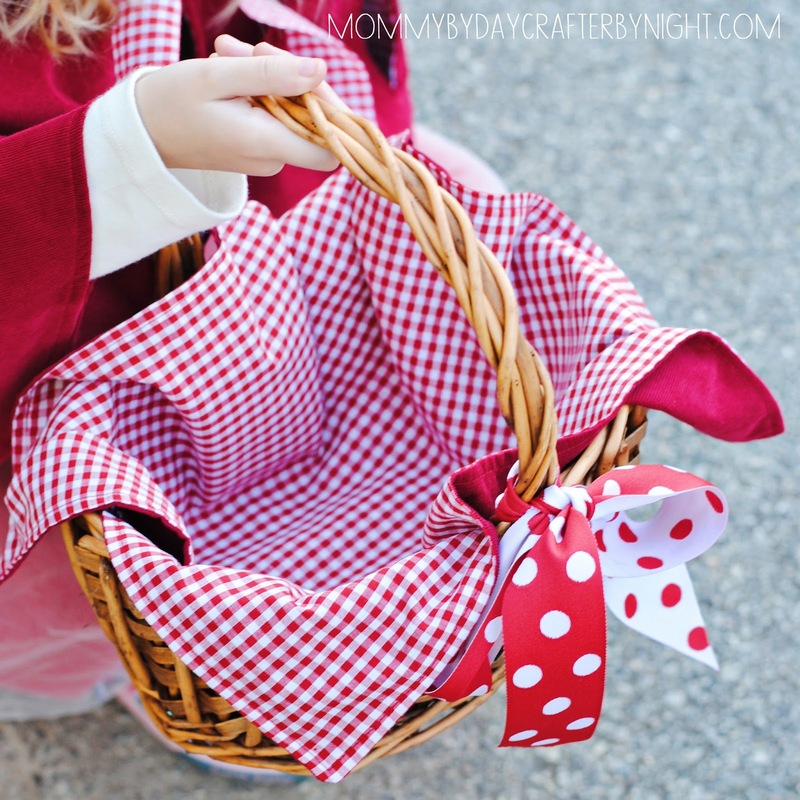 It was perfect because she used this basket to hold the treats while trick or treating. I am all for functional props! I hope y'all have a wonderful and very safe Halloween! Sweet Sassafras! Have y'all heard of Sheriff Callie? 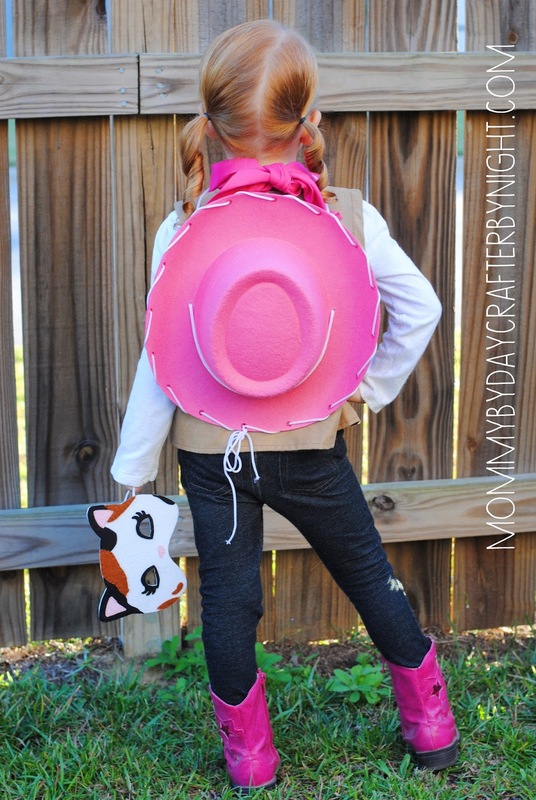 Well, my 4 year old daughter LOVES her and decided that she just had to be Sheriff Callie for Halloween this year. The only problem is that Disney hasn't come out with a costume yet. So that meant one thing... CRAP! I've never made a halloween costume before... and to be honest, I kinda wanted to keep it that way. "Aint' nobody got time for dat!" It's one thing if you are saving money to make a costume yourself, but in my experience with handmade costumes this year, I spent twice a much as I would have if I had just bought costumes and let's not even talk about the time I put into it. My little gal had her mind made up though... No persuading her. So I started brain storming with her help and we decided that we needed to make a mask. I think it turned out so cute... She loves it! I enlarged a coloring sheet found here and used it as my template for making the mask. 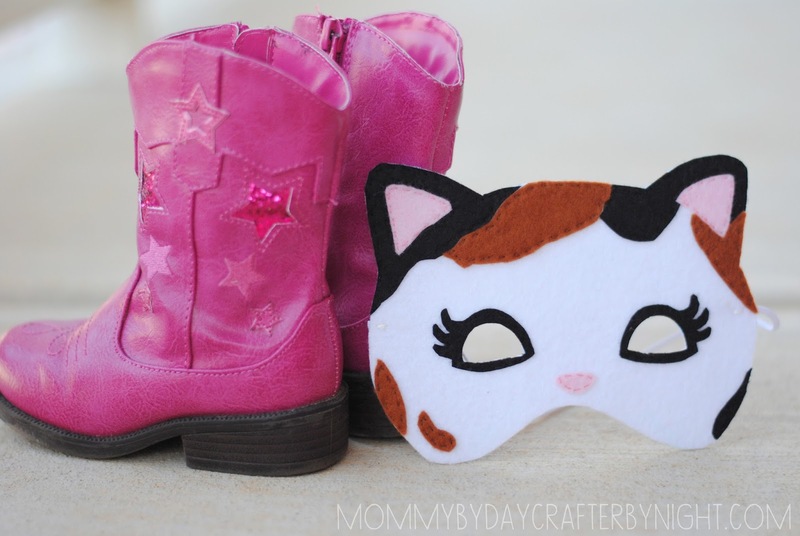 I used stiff felt (I got mine at Hobby Lobby) for the white of the mask and then just used cheap felt for the rest of the pieces to create the face. 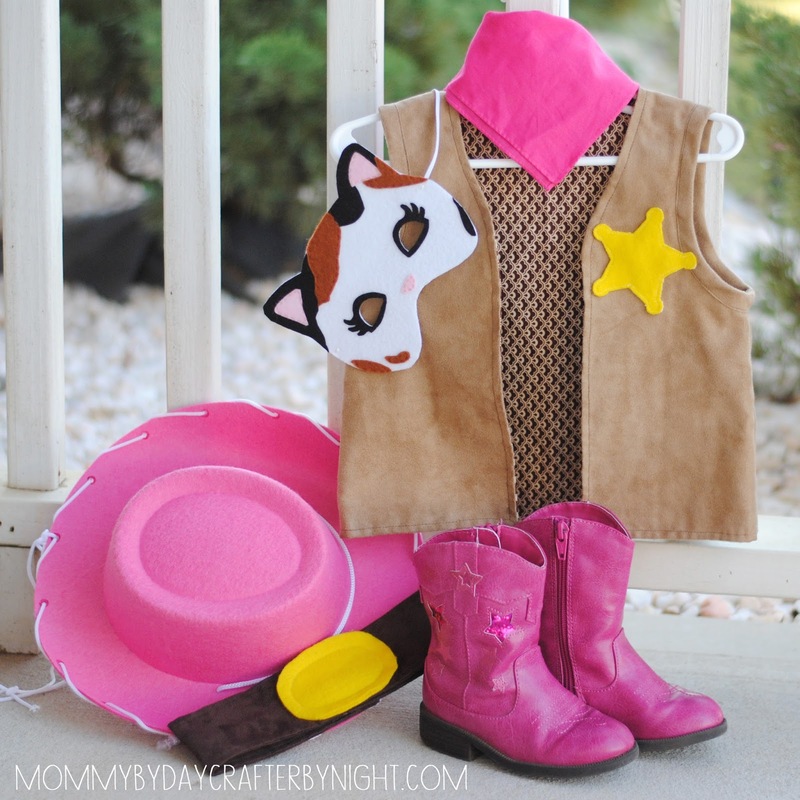 I literally just cut out each of the elements from the coloring page and used them to trace onto felt to create the design so it really looked like Sheriff Callie. I used felt glue to glue the pieces onto the stiff base of the mask and then hand stitched them on to secure. Then I used some elastic and sewed it to each side of the mask using a zig zag stitch with a 0 stitch length and bar tacked the elastic to the mask on each side. That's it... Super easy! 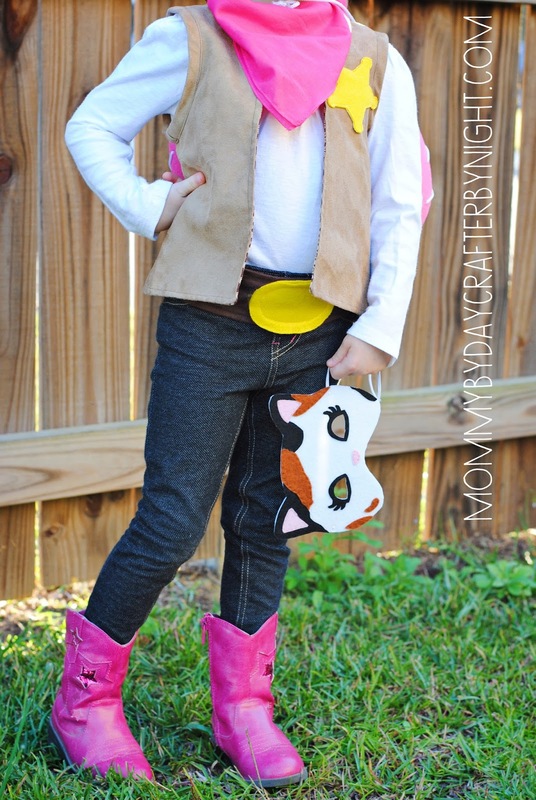 I modified the Oliver + S Explorer Vest pattern found in Little Things to Sew book. I used the smallest size of the pattern because my daughter is a tiny 4 year old and I wanted the vest to be fitted. Then I trimmed the pattern piece for the front of the vest so that it didn't come up so high around the neck and had a more "western" shape. I also left off all of the pockets and buttons on the vest. I used tan faux suede (hobby lobby) for the outside of the vest as well as the bias tape and then used some quilting cotton for the lining. I used the deputy badge coloring page found here as a pattern to cut the yellow felt and then stitched it to the vest. Belt: I used dark brown faux suede (hobby lobby) and created a belt that velcros in the back with a felt oval belt buckle sewn to the middle front. I hope you all have a wonderful and very safe Halloween! Any Buckeye fans out there?? Can I get an OH-IO?!? This post is sponsored by Fabricworm. One of my girls favorite things to do is play "Baby"... which consists of packing every play baby item that they own, loading up their strollers, and going on an adventure with their bitty babies all over the house. They usually use their messenger bags that I made them as diaper bags, but as we have collected more and more baby clothes, the bags aren't quite big enough to hold all of the items. 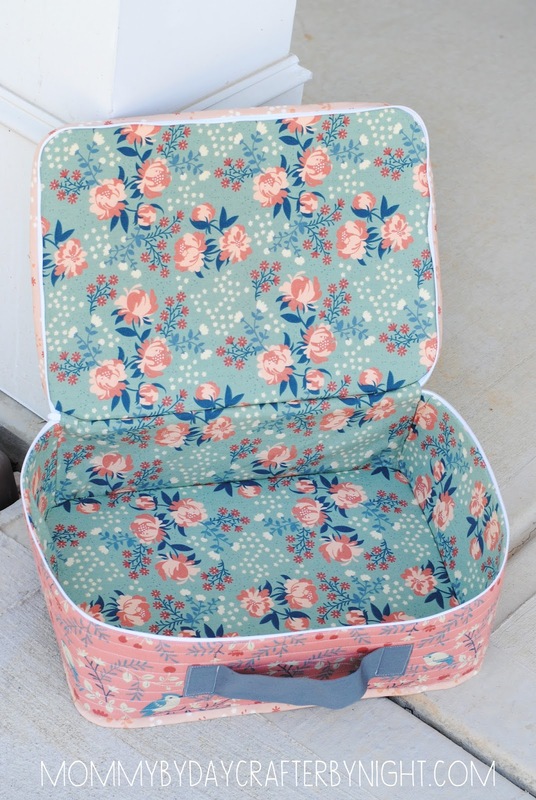 So last year, I made a dolly suitcase for them to share. The only problem was just that... sharing! That little suitcase is very much fought over in our house... and who can blame them?! It is pretty darn cute! 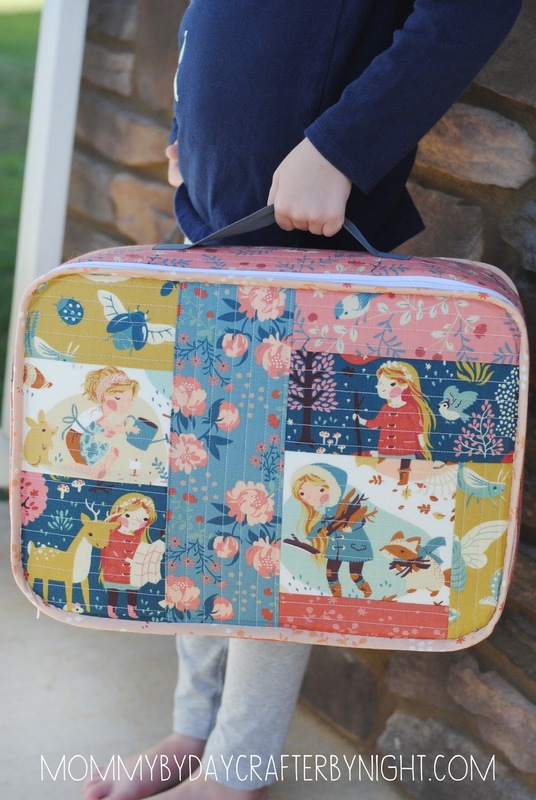 So after months and months of promising another suitcase to play with, and having the perfect bundle of Acorn Trail fabric show up at my doorstep from Fabricworm to use, I hunkered down and made a second suitcase. Let me start with a preface. 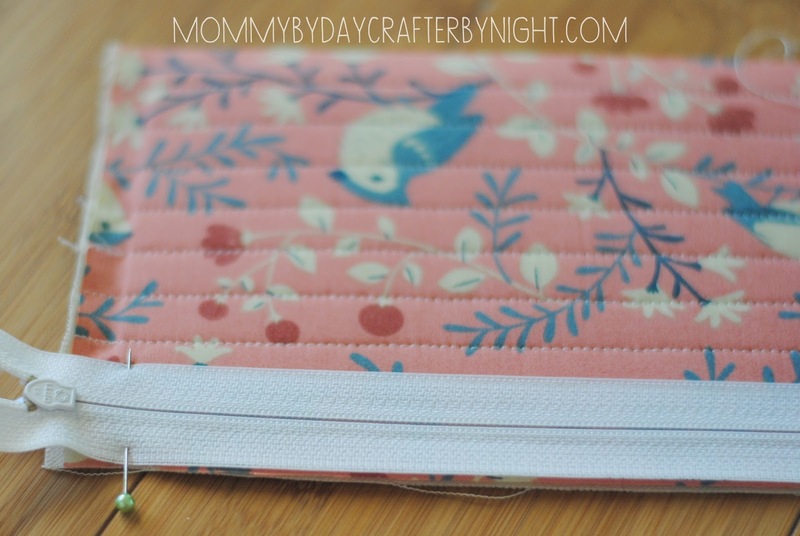 I made this case bigger and sturdier than my first case- which resulted in a tougher sewing job to complete, but I really love the result of how shapely it is. I will warn ya- there were brief moments of "Weekender Bag" flashbacks and a short, but very real moment where I wanted to throw it across the room... 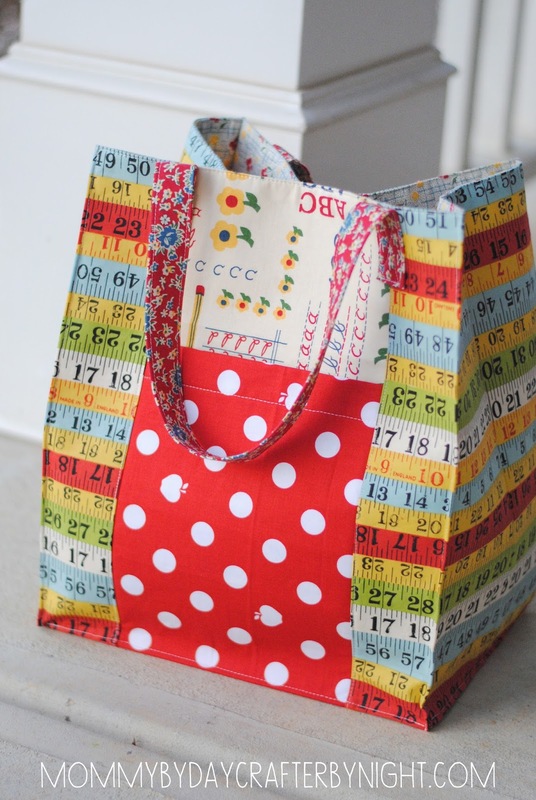 But all in all its a fairly simple bag to construct- especially if you opt not to do a "super sturdy" version... I'll explain that option in a bit. 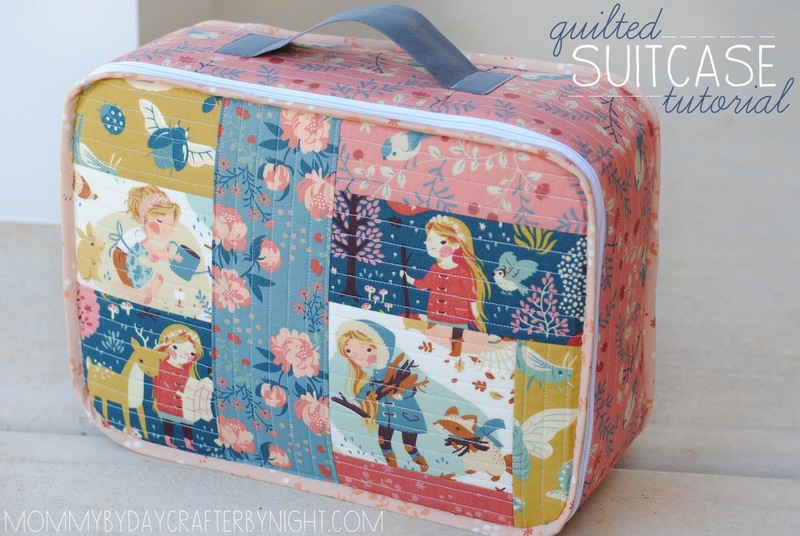 For this case, I used a Quilt As You Go method for making my pattern pieces (just like I do in my Weekender Bags). I learned the technique from Elizabeth of Oh Frannson. 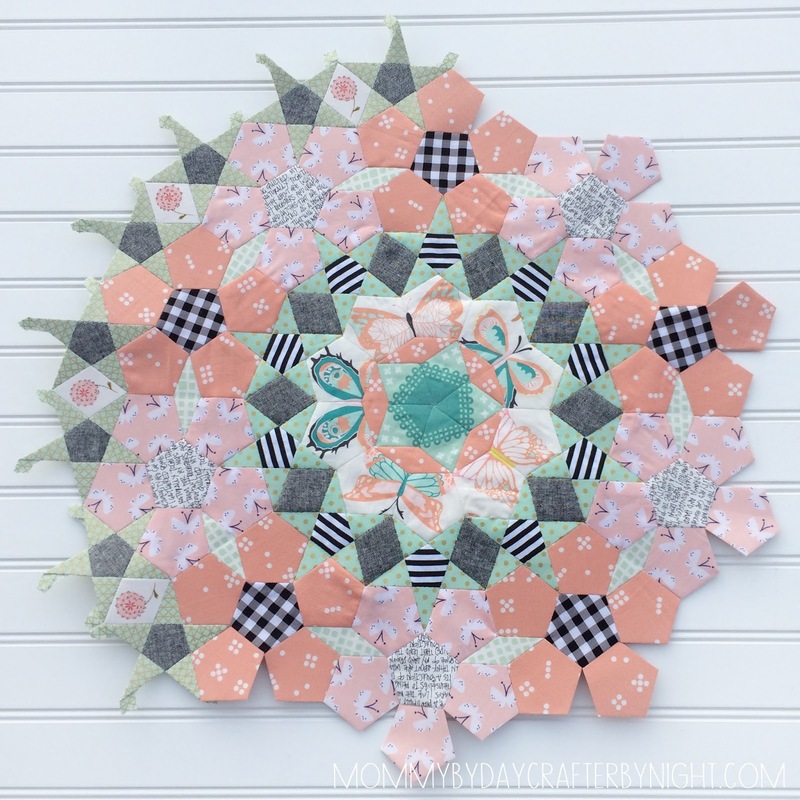 She has a fabulous tutorial if you are not sure how to do this (just click to the link above). 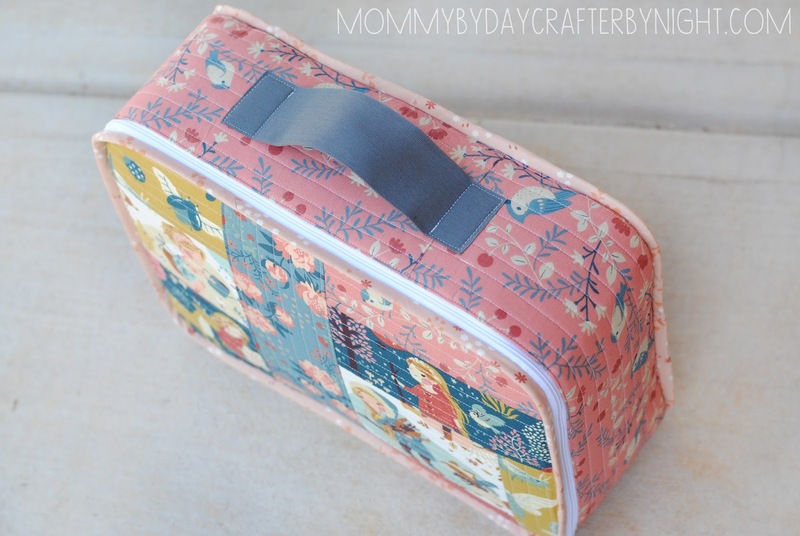 The only thing that I did different for this bag, was I substituted and used fusible peltex instead of quilt batting which resulted in a super stiff panel for my case. I really love the flat stiff panels that I created- but like I said... there were a few moments that I was regretting that choice! 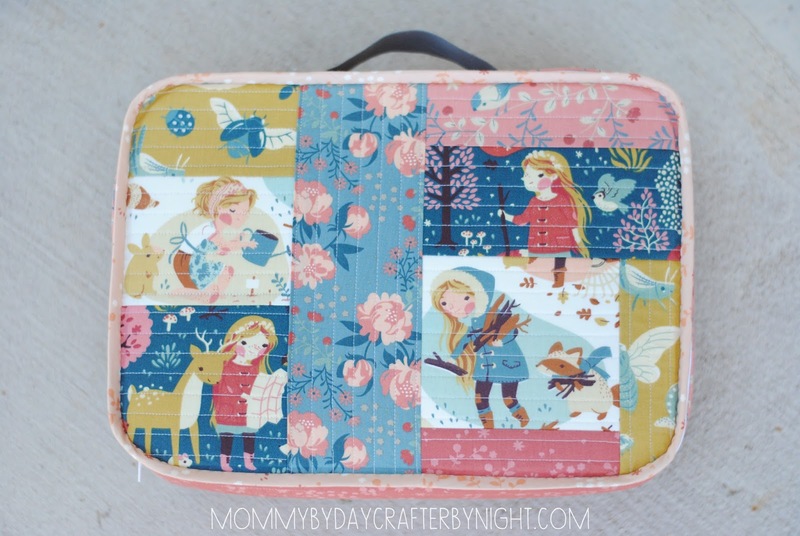 Sewing with peltex is a pain, but now that I am all done- I love it! So for the supply list, I'm gonna give the sturdy (peltex) suitcase list and the softer (non-peltex) suitcase list and depending on which version you make, you'll just make adjustments throughout the pattern, but I will do my best to accommodate my instructions for either version. Keep in mind that when I say "softer"- I use that term lightly... 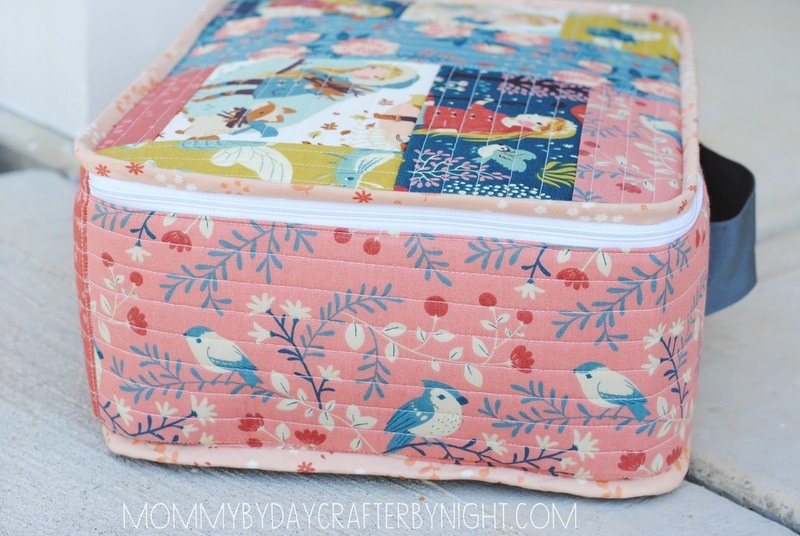 Creating a quilt as you go panels for your project results in a very sturdy/stiff case... But using peltex results in a RIGID case. Make sense? 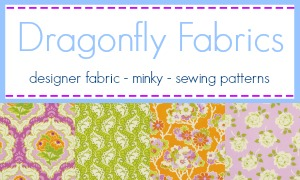 Please remember that I am an not a professional pattern maker. I just do this for fun. You may find a mistake or two in my instructions/design of the case. 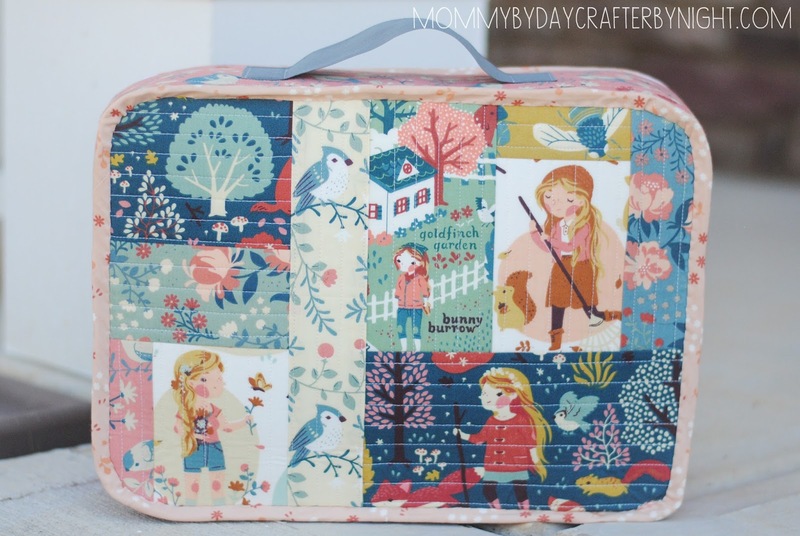 My hope is that if you are making this, hopefully you aren't too new to sewing and you've probably made a bag or two and should be able to make any adjustments needed along the way. 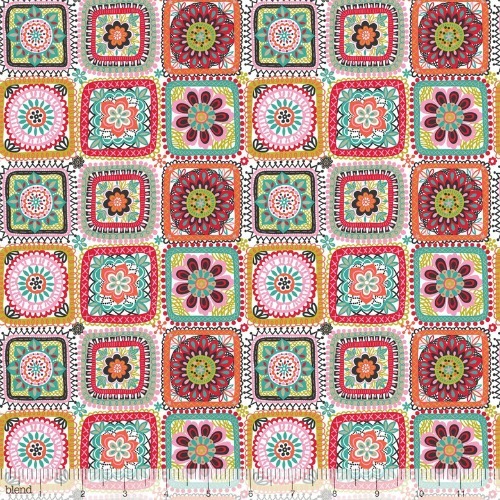 And as always- my patterns are for personal use only... DO NOT MAKE ITEMS USING THIS PATTERN TO SELL. Whew... Enough chit chat- yes? I am going to give a few supply lists. 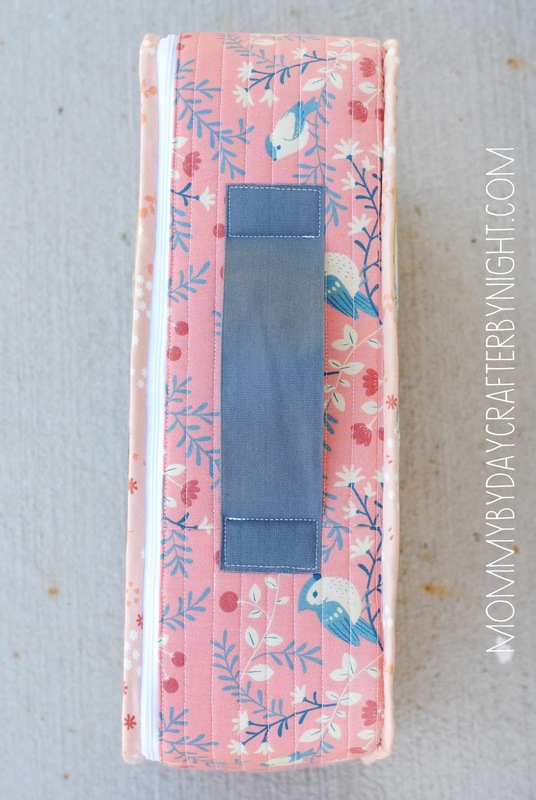 The first list will be the supplies you need regardless of whether you are making the stiff or softer case. The other two lists will be specific to whichever case you are making. Keep in mind that my case is about 11x15 inches and is 5 inches thick. 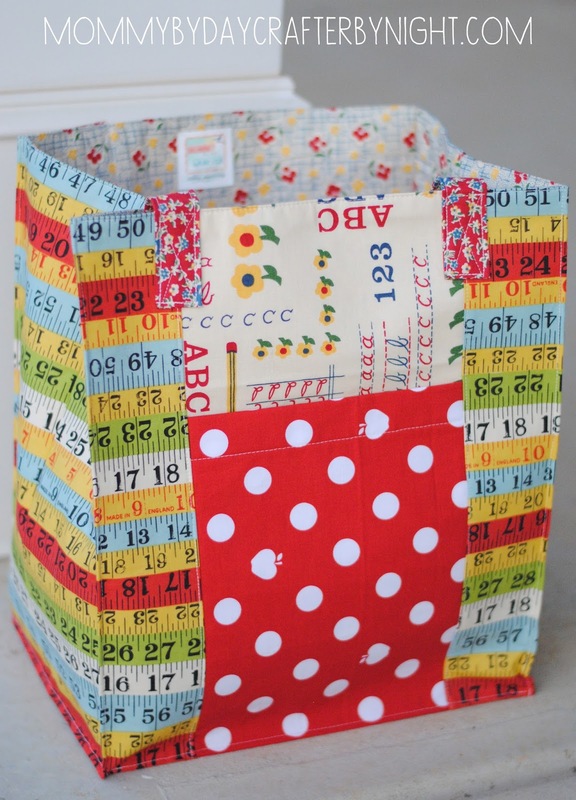 You can totally make your own size, but the supply list and my instructions will accommodate this size. One last thing... 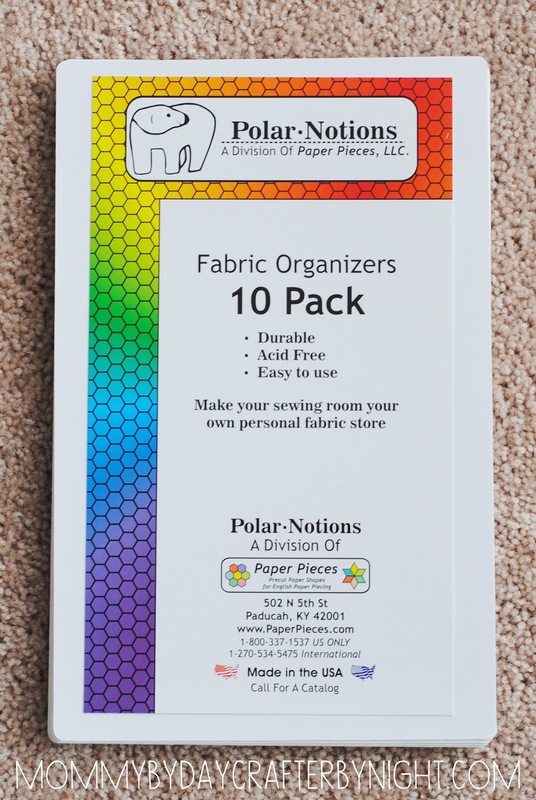 Please read through the entire tutorial before buying your supplies. There are a couple modifications you can make that are not included in the supply lists. 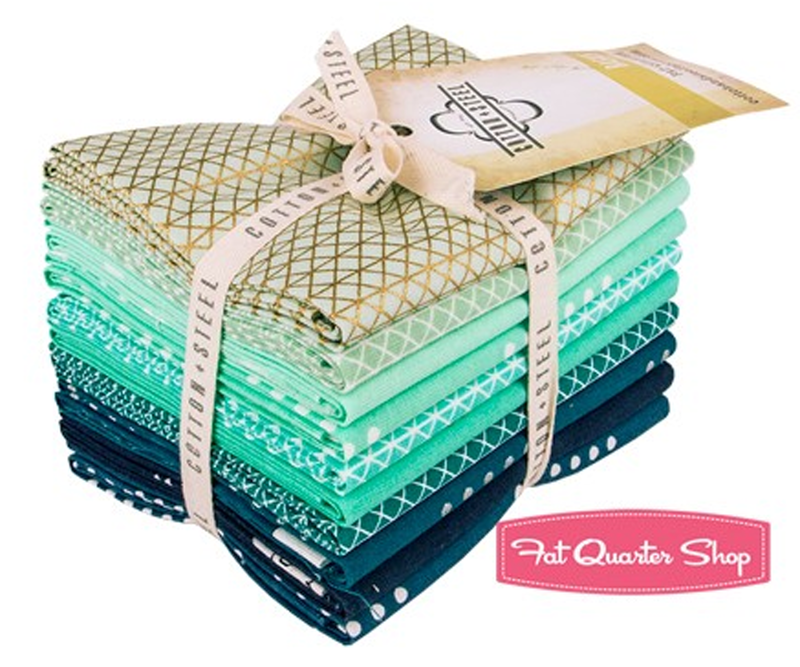 -Regular quilting machine needles as well as heavy duty machine needles to change out throughout the project. Alright... I think we are ready to start! First we need to do some cutting. 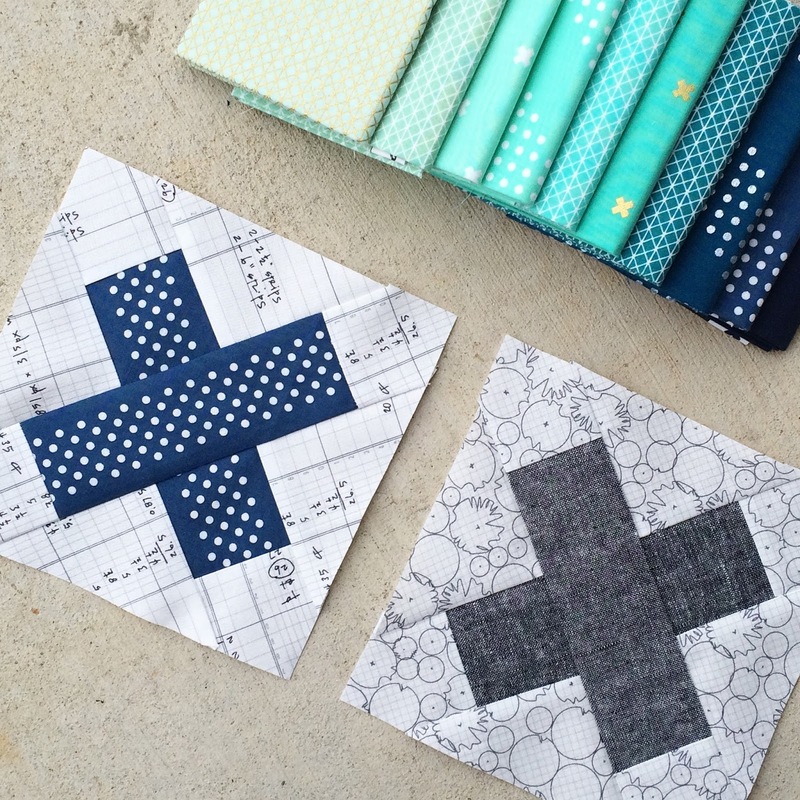 Step 1: We need to make our quilted panels first. 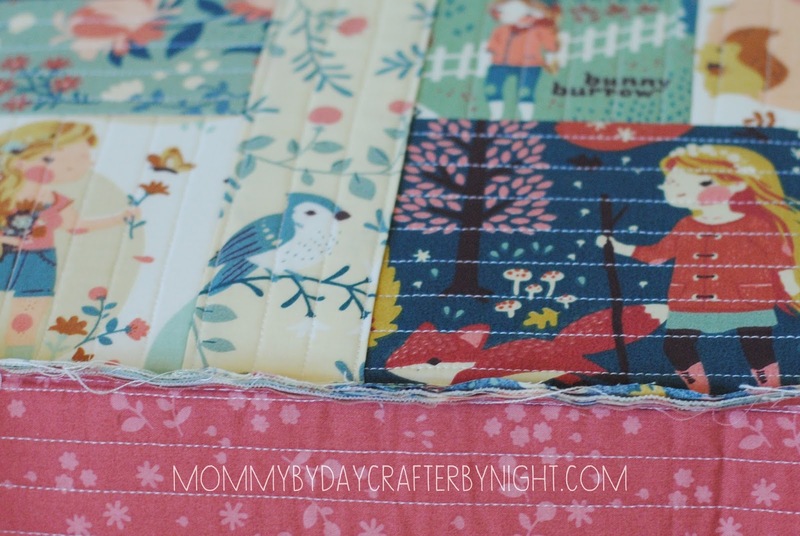 This is done by taking your drill/duck cloth panel, layering it with your peltex (and fusing) or quilt batting centered on the panel and then doing your quilt as you go method to cover both layers and make one panel. You will need to do this with your front and back panel as well as your side panel. 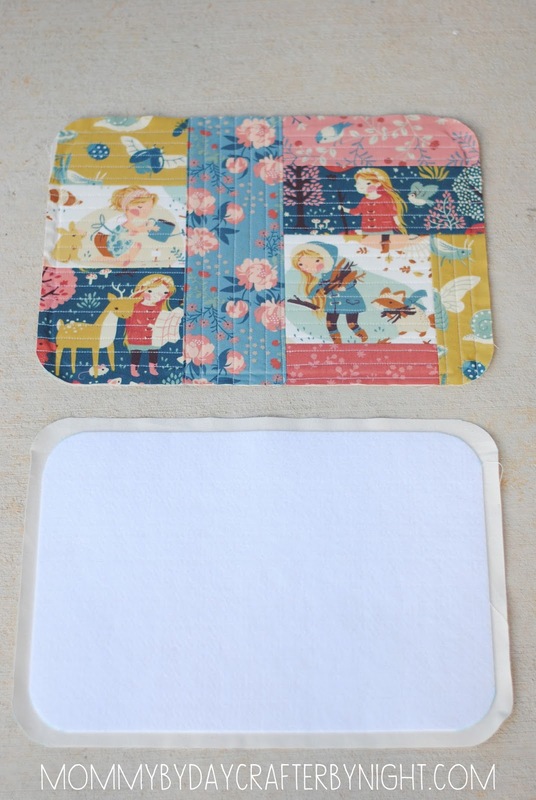 I like my front and back panels to have a slightly rounded corner, so I used a jar lid as a cutting template and rounded the corners before I started my quilt as you go. 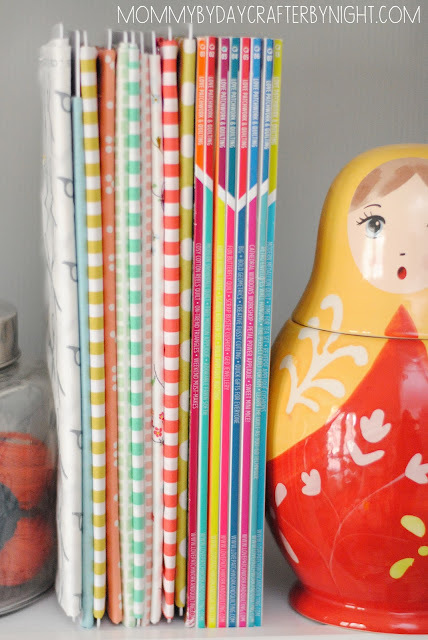 If you want, you can leave your corners square, which will result in a more boxy/square case. One thing to note... if you are using peltex instead of quilt batting, you may need to insert a new needle a couple times throughout your quilt as you go panels... Sewing through the peltex is really easy, but it seemed to dull my needle quicker than usual. To cut down on the time, I used one fabric for the side panel instead of doing a scrappy panel- but you can do yours however you like. 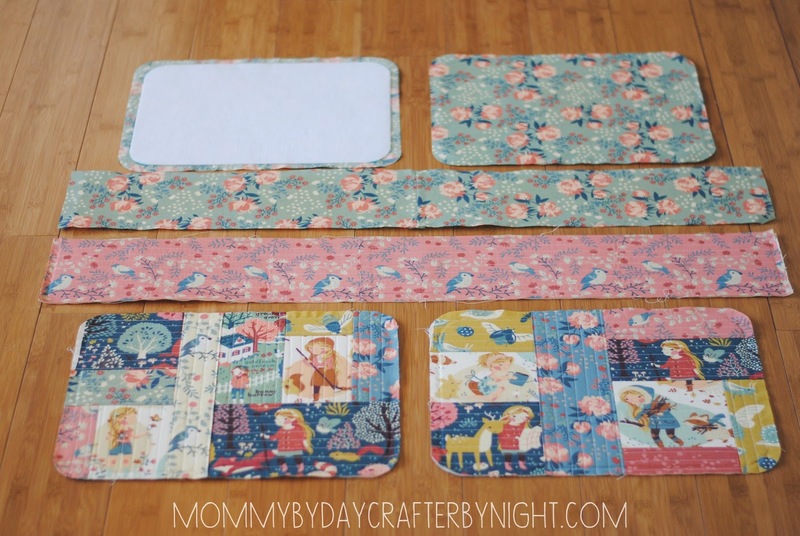 So once you are finished with your quilted panels, you should have your front panel- back panel- side panel (all quilted), and your front, back, and side panels cut for your lining. Step 2: It's time to add the zipper to your side panel.. Take your quilted side panel and place your zipper face down along the top side of the panel and pin in place. 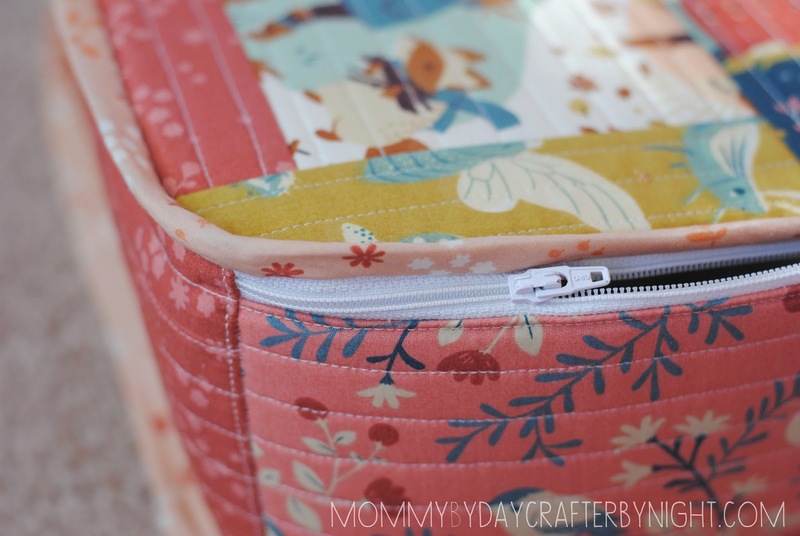 Using a zipper foot and the longest stitch on your machine, baste your zipper to the panel with a 1/8" seam allowance. Step 4: Once you have sewn your seam, fold your lining panel to the back and press. 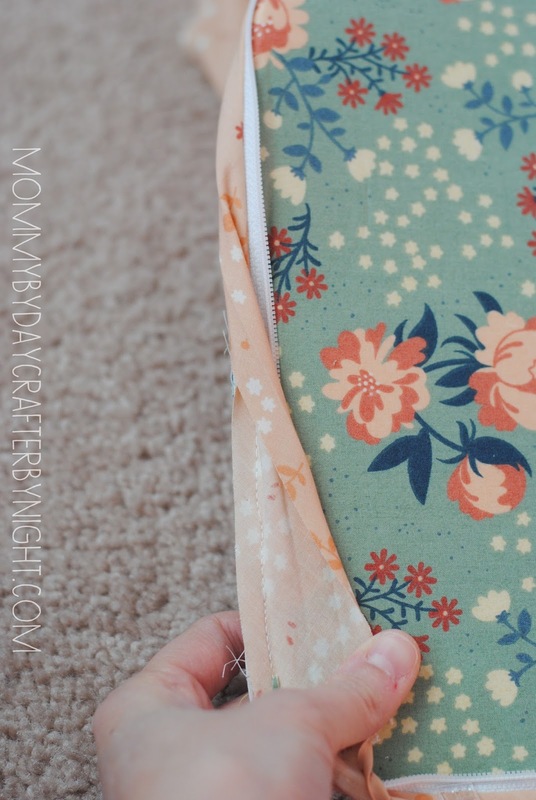 Then top or edge stitch along the top of your panel to give it a finished look and also hold your lining in place to allow your zipper to open and shut nicely. Now measure how tall your zipper panel is with your zipper closed. Mine was 5 1/2 inches tall, but yours may be slightly different. Take the 2 measurements and that will be the size of your "bottom panel". 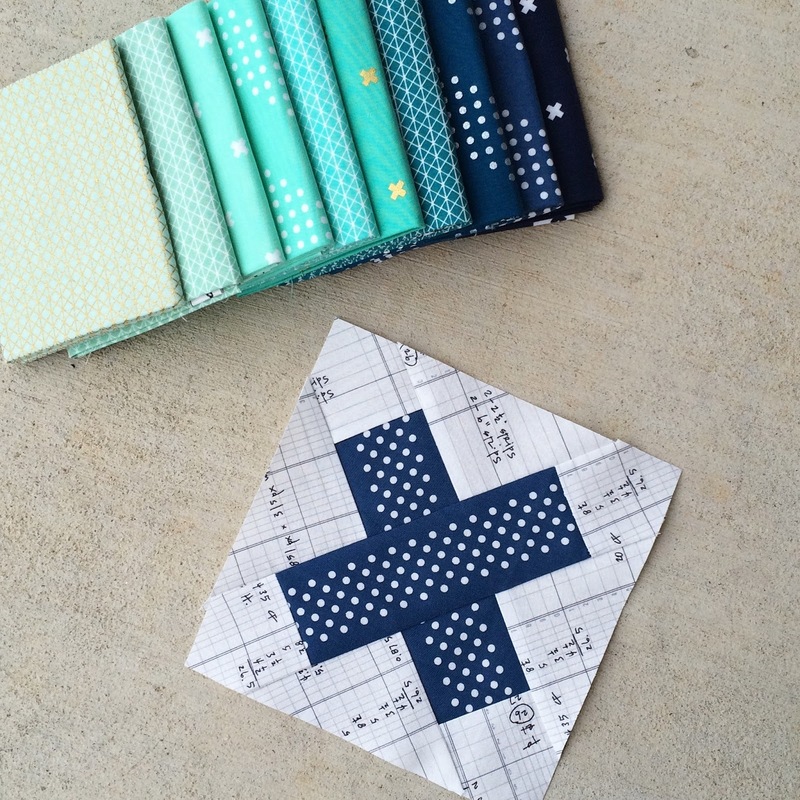 You will need to cut out your drill/duck cloth and also your lining piece (my panel was 5.5x14 inches) and then cut out your peltex/quilt batting (remember to cut it slightly smaller than your panel to allow for less bulk in seam allowance). 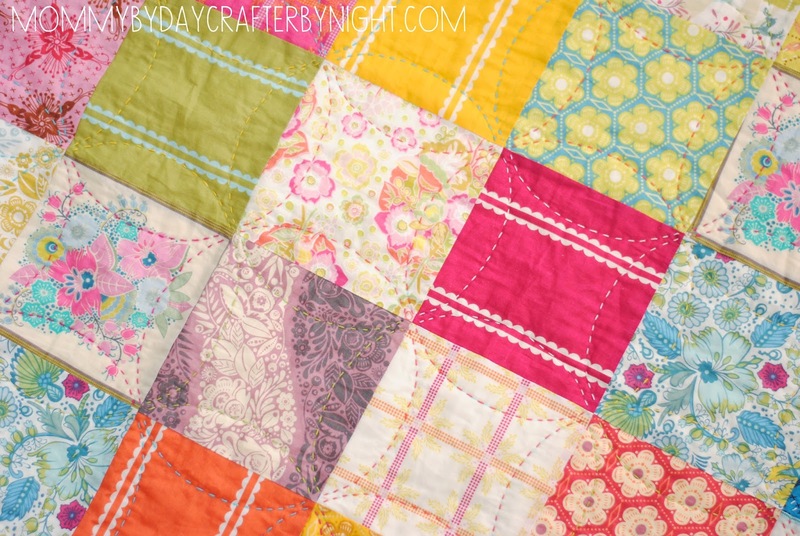 Once your bottom panels are cut, use the same technique to quilt your bottom panel. Again, I used a solid piece of fabric instead of going for a scrappy look, but you can do whatever you would like. Now it's time to put your heavy duty needle into the machine. Attach your bottom panels to your side zipper panel. 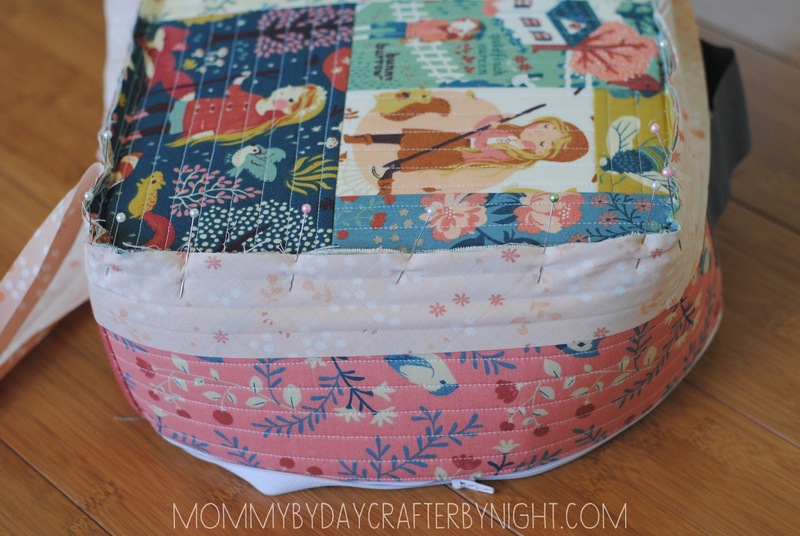 first take your quilted bottom panel and place it right side up . 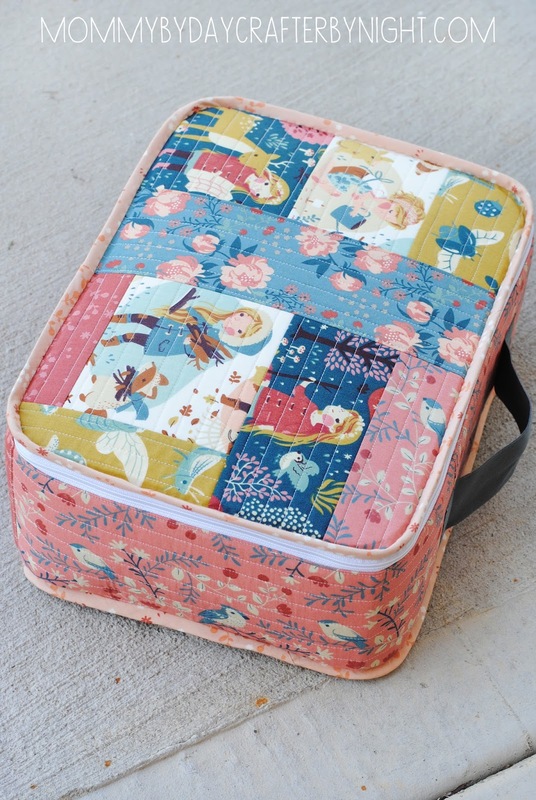 Then take your zipper panel and place it so that the exterior side or quilted side of the panel is facing down with the zipper closed. Then place your bottom lining panel right side down and pin along the end. Sew layers together using a 1/2" seam allowance. Do the same to the other side. Since your zipper side panel is so long, you will need to fold it in between your bottom panels to sew the 1/2" seam on the other side. See below for example. Now once both sides are sewn and you flip everything right side out, your zipper side panel and bottom panel should be making a big circle. 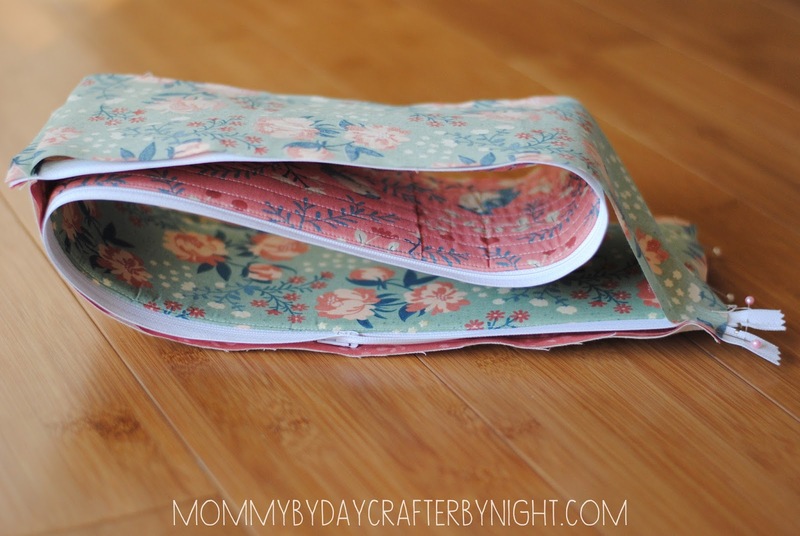 Press the bottom panels in place on and top stitch using a 1/8" inch seam allowance on both ends of the bottom panel. After topstitching the ends, you can bast your bottom lining panel and quilted bottom panel on each raw edge if you would like just so everything holds together- but not necessary. Tip- For some reason after I did this step, even though I measured around the perimeter of my front and back panels and I made my panel without adding any for any seam allowance, the side panel (zipper and bottom panel sewed together) was still a little long. 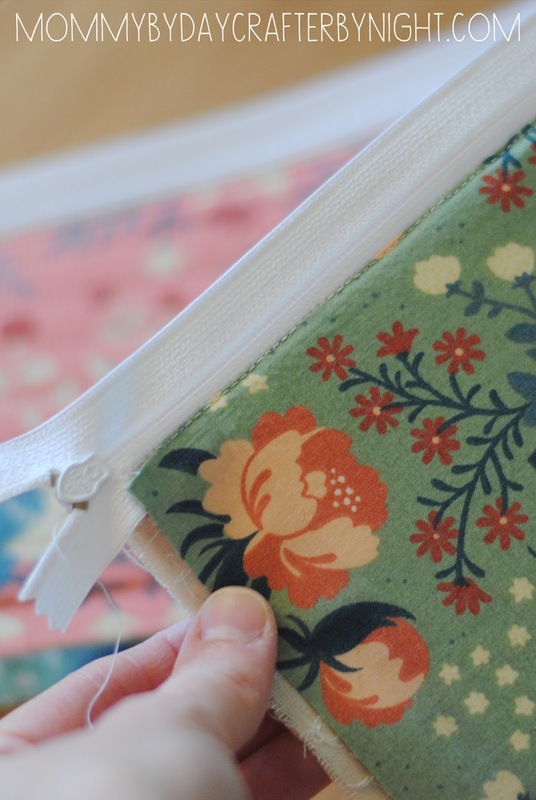 (I have found that when I am pinning fabric to a curve for a bag, I don't need to add seam allowances, sometimes less fabric through the curve gives a better finish less bulk. and with the peltex being in my side and bottom panel that was even more true.) So when I made this bottom/side panel the length I had calculated (even without adding any fabric for seam allowances), when I went to pin and attach my side/bottom panel to the back panel, it was just a little too much bulk through the curves of the bag and I needed to shorten both the side and bottom panels about a 1/2 inch to make my panels and peltex smooth out and not have a wavy side and bottom of my bag. So I folded everything back and repeated the above step after removing 1/2 inch from both the side and bottom panel. So you are probably wondering why I didn't have you do this to start with right? Well since I made my bag with crazy amounts of peltex, I think that may have a lot to do with why I had to do this. Peltex doesn't gather and ease around a curve super well so it needed to be a perfect fit for my side panel to lay correctly. So I would suggest after you press your bottom panels, before doing your top stitching on the bottom panels, do a little "test run" of pinning your side/bottom panel circle piece to your back panel just to make sure that your panel is the right length and everything fits well together. Unpin and make any needed adjustments. Then you can top stitch that last edge of the bottom panel. (If for some reason your panel is too short, you can always shorten your seam allowance to 1/4" instead of a 1/2" to make your panel a little longer. Step 7: Attach your handle to the side panel. I did this by using fray check on each end of my ribbon to prevent the ribbon from fraying (if you don't have fray check you can just fold the raw edge under and then sew) and then centered the handle on the zipper side panel, pining in place, and stitched a 1 inch rectangle on each end to secure it. 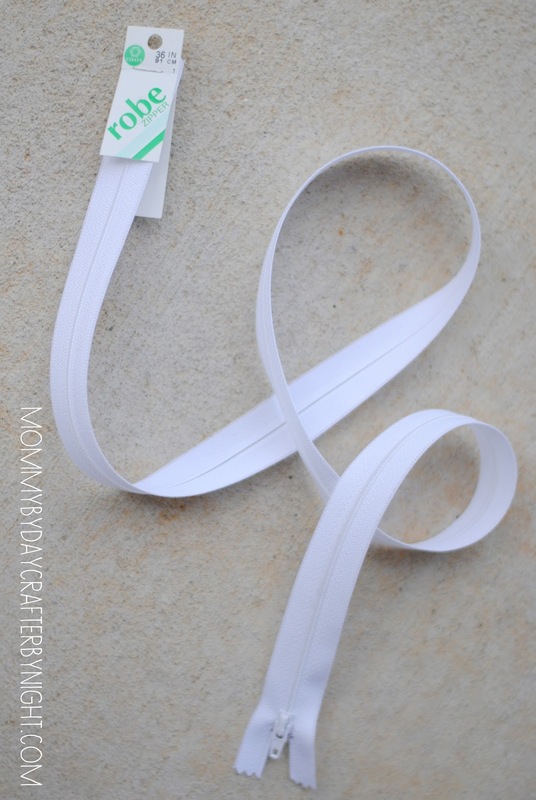 There is no rhyme or reason to how much of a bend you put in the ribbon when attaching it... It's all personal preference and as long as you center it on the panel properly, the weight of the bag should be evenly distributed. Step 8: Now it is time to assemble the case. 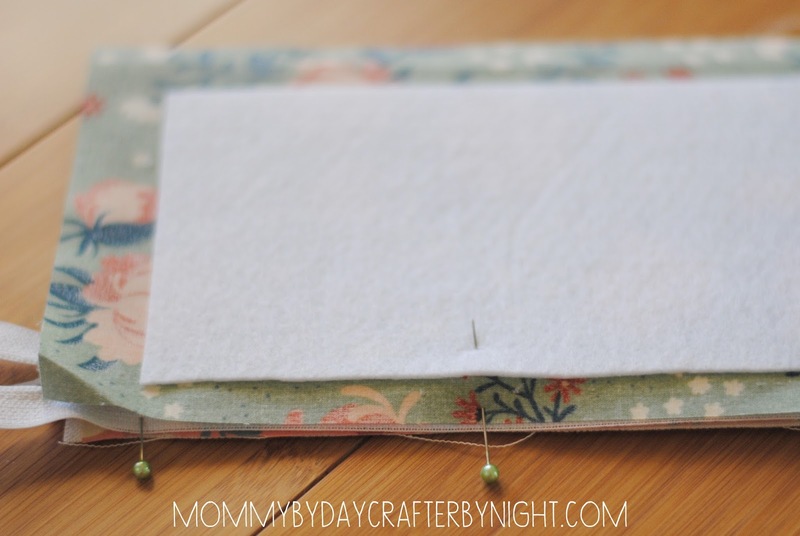 Do this by marking the center of your bottom panel and the center of your zipper panel (these are attached to each other at this point but just fold the piece in half to find the center). Then mark the center of the top and bottom of your back panel. Now, using your center marks, start pining the bottom (raw edge- not zipper edge) of your zipper/bottom panel around the perimeter of your back piece. 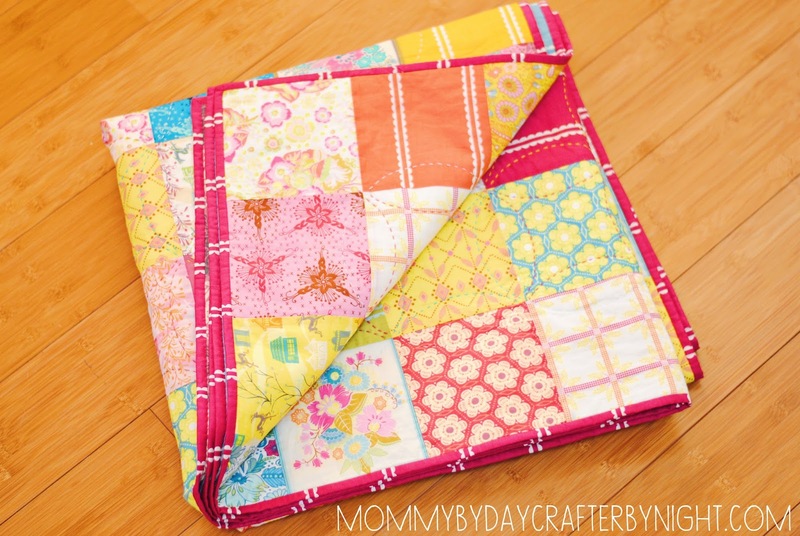 Do this by putting the linings right side together and your quilted pieces should be facing out. We are going to have our raw edges left exposed when the case is sewn together. See below. 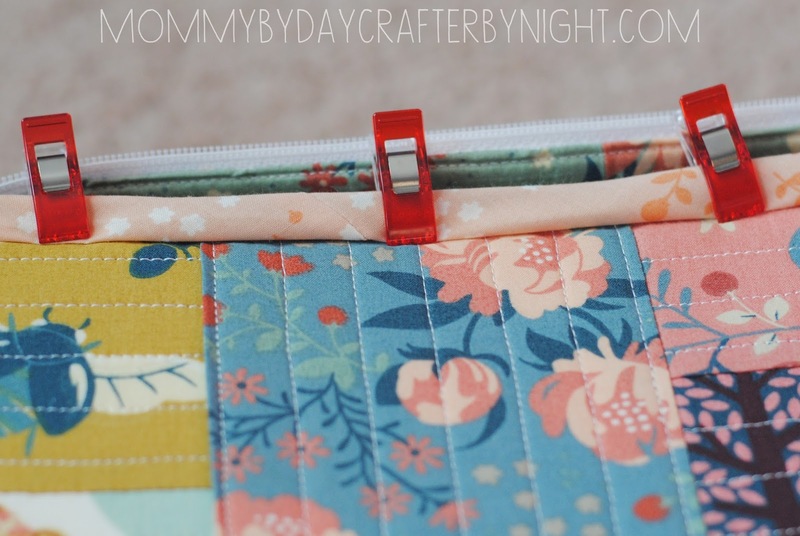 Tip: You may want to make small clips in your side/bottom panel piece to ease it around the curves of the back panel while you are pinning and sewing. Once the zipper/bottom panel is pinned in place to your back panel, use a basting stitch and sew using a 1/8" seam all the way around the back panel. After your panels are basted together take your bias tape and apply it. 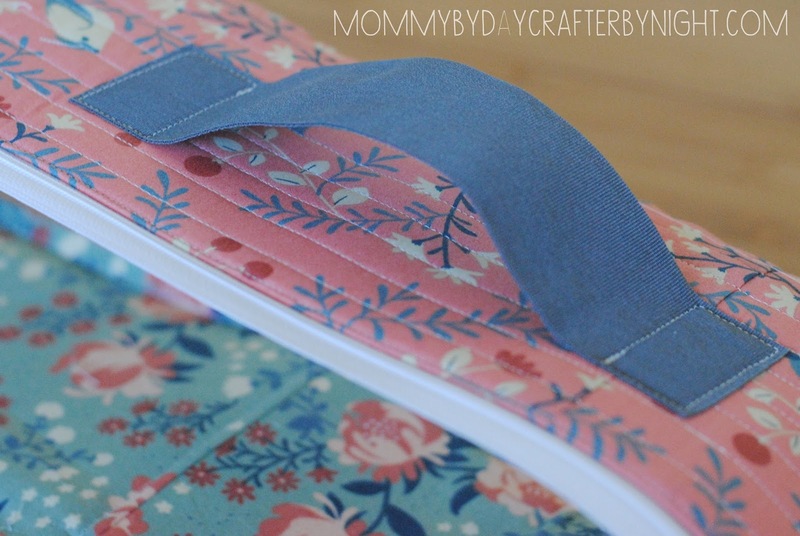 The bias tape will conceal the raw edge. 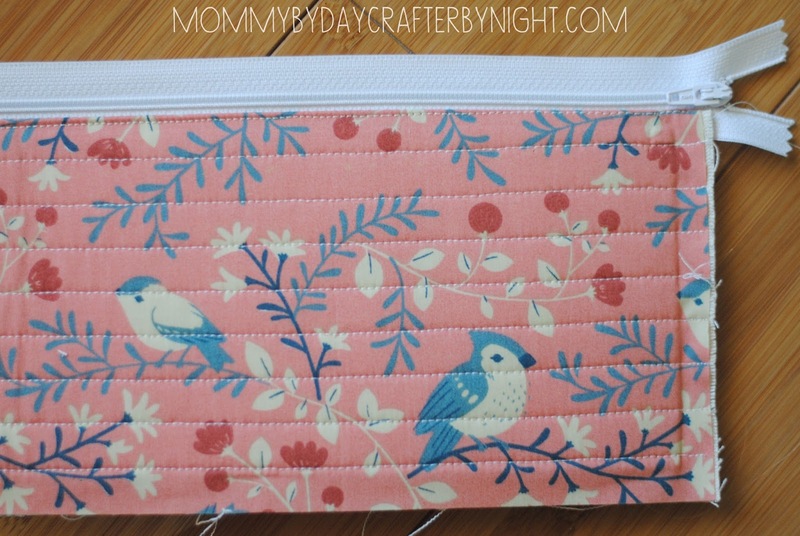 I used my machine to sew it to the "side" edge of the case and then hand stitched the bias tape to the back panel. See below. After you have attached the side panel to the back of the case and applied the bias tape, you need to attach the side panel to the front panel. 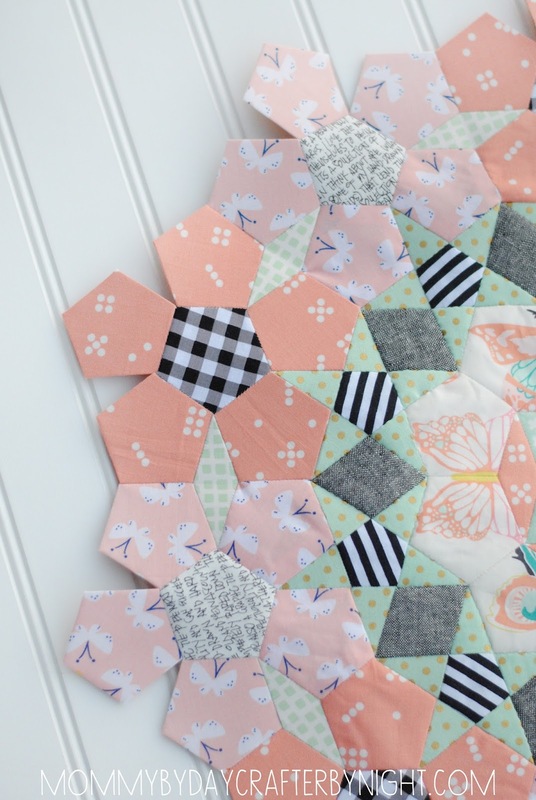 This is so much easier than attaching it to the back panel- so if you are about ready to toss your project across the room- hang in there! Once your two panels are pined together, baste around the edge with 1/8" basting stitch to hold everything in place for while you apply the bias tape. Once they are basted together, apply your bias tape. Again, I applied mine to the zipper side with my machine (and a zipper foot) and then hand stitched the other side of the bias tape to the front panel. I don't mind hand sewing- but you can do yours however you would like. I used quilt binding clips to hold it in place and I hand stitched. I hope you enjoyed this tutorial and I hope everything makes sense! 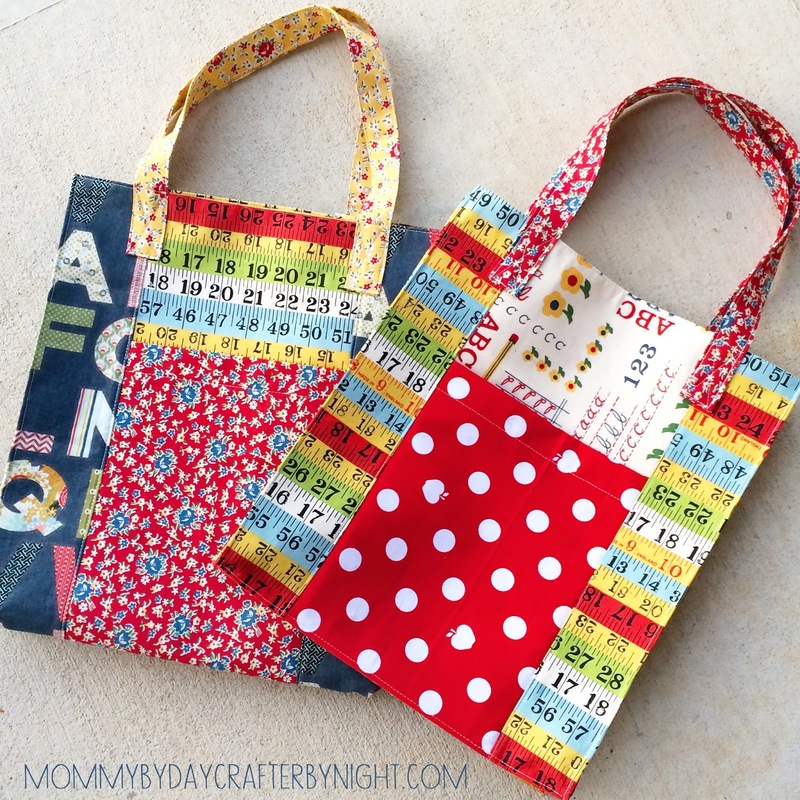 I love seeing everything you guys make following tutorials on my blog so be sure to tag me on instagram (@crafterbynight) or email me a picture of your cute projects along the way and after you finish! P.S. Fabricworm sent me the fabric for this project. 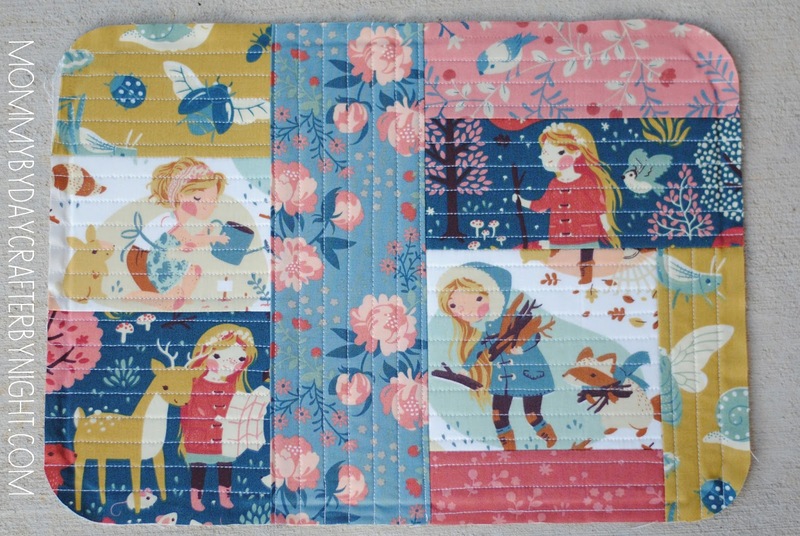 I used various prints from the Acorn Trail collection by Teagan White for Birch Fabrics to do the patchwork panels. 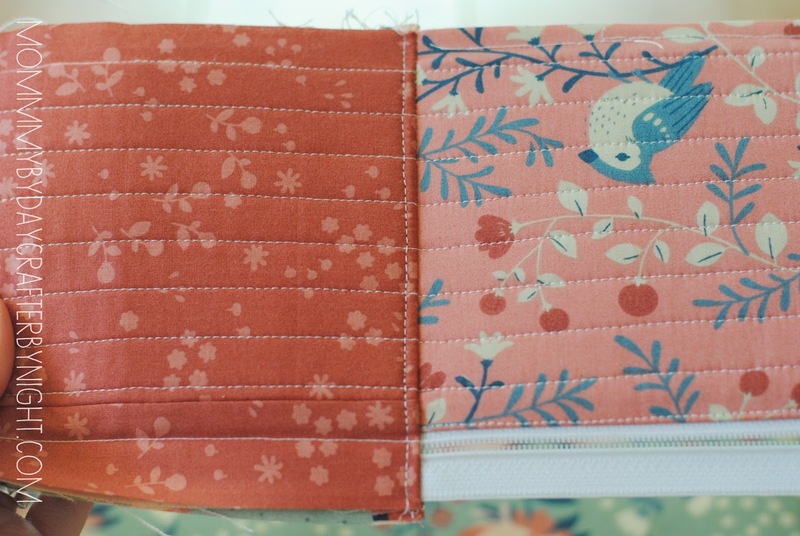 I used Tonal Floral Shell for the bias tape, Birds and Branches Coral for the side panel, and I used Peonies Mint for the lining. LOVE this collection! So gorgeous!